Divers say they've discovered the remains of the Revenge, a ship commanded by U.S. Navy hero Oliver Hazard Perry and wrecked off Rhode Island in 1811. Perry is known for defeating the British in the 1813 Battle of Lake Erie off the shores of Ohio, Michigan and Ontario in the War of 1812 and for the line "I have met the enemy and they are ours." His battle flag bore the phrase "Don't give up the ship," and to this day it is a symbol of the Navy. One of the divers, Charles Buffum, a brewery owner from Stonington, Conn., said he's been interested in finding the remains of the Revenge since his mother several years ago gave him a book about shipwrecks on the shores of Westerly, R.I. The book included Perry's account of the wreck, which happened when the Revenge hit a reef in a storm in heavy fog off Watch Hill in Westerly as Perry was bringing the ship from Newport, R.I., to New London, Conn.
"I always thought to myself, 'We ought to go out and have a look and just see if there's anything left,' "Buffum said. Buffum, Craig Harger, who is a carbon dioxide salesman from Colchester, Conn.; and third man, Mike Fournier, set out to find it with the aid of a metal detector. After several dives, they came across a cannon, then another. They made their first discovery in August 2005 and kept it secret as they explored the area and made additional discoveries. 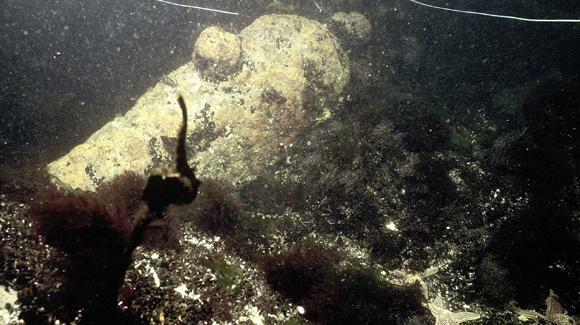 Since then, they have found four more 42-inch-long cannons, an anchor, canister shot and other metal objects that they say they're 99% sure were from the Revenge. Buffum and Harger said the items fit into the time period when the Revenge sank. They said the anchor appears to be the main one that is known to have been cut loose from the ship and that no other military ships with cannons have been recorded as sinking in the area. They have not discovered a ship's bell or anything else that identifies it as the Revenge, and all the wood has disappeared, they said.